Replacing your air filters regularly is something that is recommend for all homeowners. But how necessary is it really? A new air filter can cost as little as a few dollars, which may make it seem like an unimportant chore. It just so happens that simple looking square plays a very important role in the health of your family, the efficiency and welfare of your system and even impacts the environment. No matter what type of filter you buy, and no matter the cost, here are four reasons why it is important to replace your filter regularly. 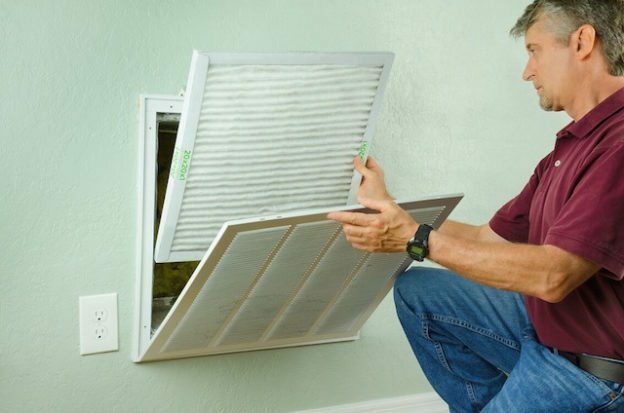 One of the best ways to improve your indoor air quality is to regularly change your HVAC filter. Your filter stands between you and the contaminants in the air. If they are already dirty they won’t be able to properly trap all of the dust, allergens, mold and other pollutants that you want to keep out of your home and lungs. This is especially important if you have young children or pets in the home, who tend to be more sensitive to these kinds of pollutants in the air. Avoid health issues and breathe easy by changing your filters regularly. A dirty air filter can only catch so many particles; eventually, that debris will build up inside your system. A clogged filter also makes it more difficult for the air to move through your HVAC system. This restricted airflow will force your system to work harder. With a dirty system that is working extra hard, it’s only a matter of time before your system breaks down or fails completely. By regularly replacing your air filter you can ensure that your system is working properly, and avoid unnecessary damage or repairs. Replacing your filter is part of the standard maintenance care suggested by HVAC professionals like those of Sandy Heating & Air Conditioning. As mentioned above, a dirty air filter will make your system work harder by reducing air flow. When your system works harder it uses more energy. By eliminating any restricting on air flow, your HVAC system won’t have to work as hard and will use less energy. Not only is this better for your machine but it will be better for your wallet as you watch those monthly balances on your utility bill drop. Do you have a goal to be more green? Good news! When you regularly change your air filter, you lower your carbon footprint. In addition to saving energy as mentioned above, replacing your filter reduces the strain on your HVAC system and lowers the amount of pollution it creates. It’s a small act, but it means lower carbon emissions. Despite your best efforts to properly maintain your HVAC system by doing simple tasks like replacing your filter regularly, problems with your system may arise that need to be addressed by a professional. If you find yourself in this situation call Sandy Heating & Air Conditioning for in-depth knowledge and exceptional customer service. This entry was posted in Blog and tagged AC Maintenance, AC Repair, AC Replacement, AC Tune up, Air Conditioning Repair, Air Conditioning Replacement, Furnace Maintenance, Furnace Repair, Furnace Replacement, Furnace Tune-Up, Heating Repair, HVAC Contractor on September 7, 2016 by admin.